Comece devagar e trabalhe o seu caminho para bater as corredeiras em uma viagem de rafting familiar. 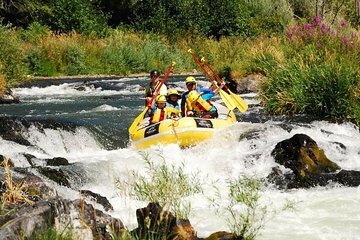 Esta excursão a Rogue River é uma divertida aventura de meio dia de Ashland, perfeita tanto para iniciantes quanto para caibros mais avançados. Progresso de remo e flutuando para corridas de classe II e III. Não é necessário experiencia anterior; guias profissionais apoiam você a cada passo do caminho. Great tour, even though I took an unplanned swim and lost my camera. Great guides and beautiful scenery. Great stuff. We took our two kids rafting and we all had a great time! Loved the time spent on the river with our excellent guides, Thorn and Taylor! Thorn was thorough in his safety speech and made sure we all understood. Even though he talked about scary stuff that could happen, I was confident that if anything happened, he could handle it! I felt a lot of confidence in him from the get go. Before we hit any of the rapids, he helped us gain the tools oar control, wedging in, how to sit and hang on and paddling in unison we would need. His confidence and knowledge brought me excitement because I knew if I fell off the raft, I would be okay. I went into the day with lots of nerves, but by the time we reached the river, I was smiling and ready to ride! Thorn was training Taylor for the day, and she will be a great guide, too! I enjoyed the ride back and forth to the river as well. Lots of cool info was shared about the area, and some really bad but funny jokes made me relax. I highly recommend this adventure! I am not an adventurer, but I am now considering going back to Ashland just to do the full day rafting trip! Bring on the rapids! Do this half day trip! You will not regret it!